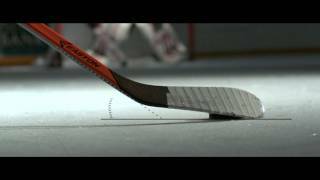 The Easton V9E is the all-new Pro Level product for the Easton V-Series line, which aims to revolutionize three key components of your shot. 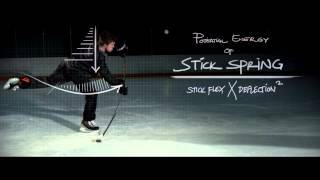 These are puck position, energy transfer, and angle of the blade. 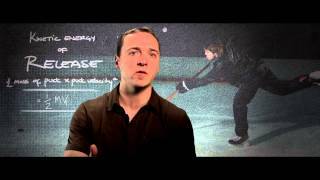 Positioning the puck on the toe forces you to load your shot, and creates more velocity. Their new Hypertoe combines a stiffer toe and a softer taper to create more force with the same load. Easton's new dual lie patterns, the E3, E28 & E36, keep the puck on the toe of your blade, and make sure your shooting area is on the ice, while the heel is slightly up to fully load the blade for an explosive snap. The Tuned Shaft Flex Profile works with your body by storing energy lower into the taper, loading your energy within the stick for a quick release and improved velocity. Shaft Design: Concave Shape of the shaft edge. Blade Construction: Segmented Blade Core Type of material the blade is made of.